I hope you've had a good week! It has been a nice quiet one here after fireworks in the neighborhood last weekend. I like a quiet week. They are my favorite kind. Not much news to report, but that is okay with me. I have a great friend visiting the blog today, and I know you will enjoy meeting her too. Stevie is a beautiful and sweet doxie. Her mother and my momma have known each other for a long time through an online dachshund community. Stevie has a GREAT home! 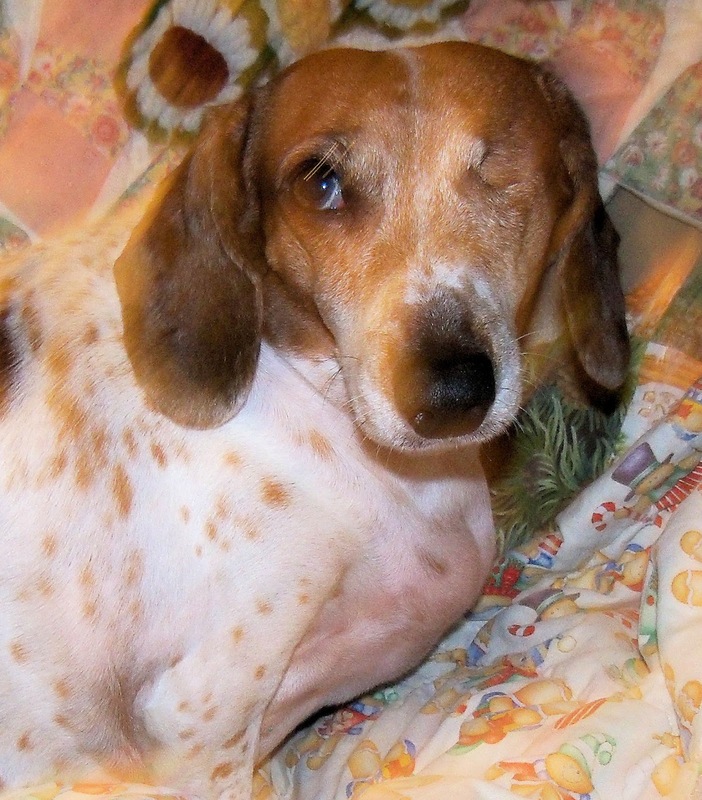 Stevie: My name is Stevie May Allen, and I am a piebald miniature dachshund. I love my forever mother and dachshund sisters, Tookie and Trixie. I took a long and difficult journey to reach my current wonderful life. I was rescued in Joplin, MO, along with my two puppies more than five years ago. 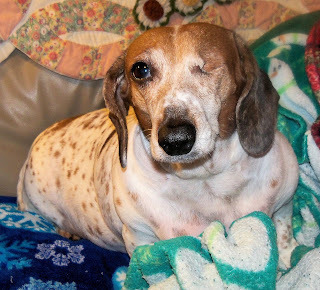 Someone had tried to hurt me, and I lost my left eye. The nice people at Almost Home Dachshund Rescue brought my puppies and me across country to my foster mother, Sue Romano, in Kentucky. She is friends with my human mother, Jennifer Allen, and Sue knew Jennifer would love me for what I am and not be upset for what I'm not. I also was heartworm positive when I arrived at Sue's home, so the great people with Almost Home took care of my health challenges before I moved permanently to my new home. Stevie: My first days in my new home were difficult because I wanted to run around and explore everything, but I had to stay quiet in a crate for several weeks because I had just finished my heartworm treatment. I was really, really curious and even escaped out the front door on several occasions -- not to run away, but to explore all the wonderful, new smells and sights. It was really funny watching my mother scream and run up and down the sidewalk as she chased me. I immediately became inseparable with Talley, who passed away less than a year later, but I was able to help her and be with her during her final months. A few months later, another rescue dachshund, Trixie, came to live with us, and she and I love to go out on the deck together and bark at everything that moves. Tookie, on the other hand, is the Greta Garbo of the dachshund world and just prefers to stay quietly under a pile of blankets on the couch most of the time. She thinks Trixie and I are so silly for our antics out on the deck. Stevie: My favorite things are snuggling with my mother in bed at night or on the couch as well as enjoying some time every day (when it's warm and dry) out on our little deck. Every day when my mother leaves for work, she tells me that I'm in charge. I take my job very seriously. Stevie: I think everyone should reach out and adopt a rescue. It is wonderful to have a new home and family, and I promise that every rescue just wants to give love and to be loved. That's pretty much my story. I am happy, healthy and full of life and love. I think rescuers are the best people in the world. Thank you so much, Stevie, for visiting today. I loved learning more about your story. It's wonderful that you are in charge when your mother goes out ... I know you do a great job with that duty! Friends, if you would like to leave a comment for Stevie, you can do so in the comments below. 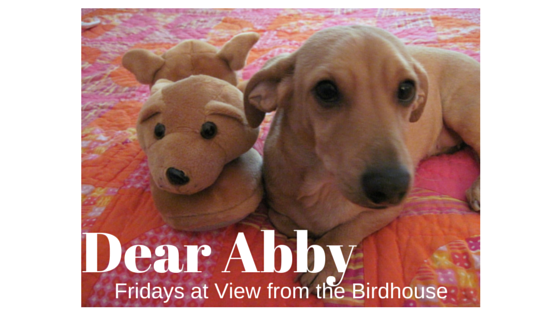 Please also let me know if you have a "Dear Abby" question or a rescued pet who would like to be featured. Such a cute dog! Reading this kind of stories always warm my heart, because those rescued pet deserves all the best! Such a cutie! My family rescued two greyhounds. Rescuing is the best! These dogs have such a rough start, they totally deserve a good home. Oooo this little honey melts my heart!!! How could anyone hurt a sweet dog like this? I don't understand. Glad she found a great home! Awe. What a sweetie. I love how she spent time with the other dog that was sick and helped her. I'm so glad Stevie has a wonderful home now. Oh this is just so cute! hehe First days sound like a little bit of chaos! Thanks for visiting! I really enjoyed reading your comments. Shann, I agree about Stevie staying with her sick sibling to comfort her ... what a special dog she is!